Firemen arrived to find the barn engulfed in flames. 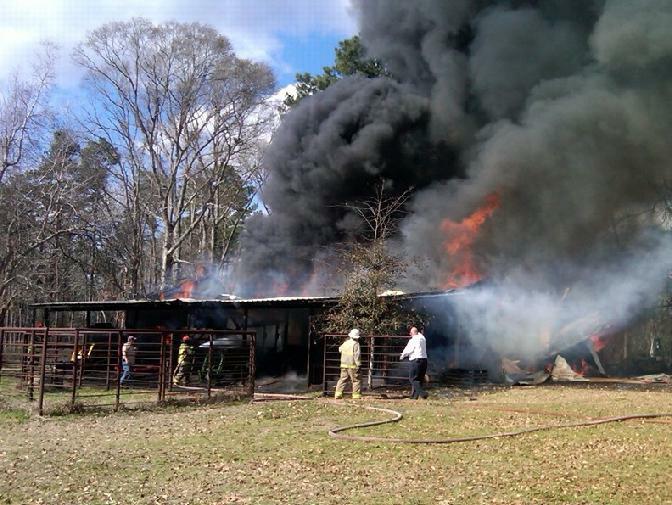 Fire Burns Down Barn With Lots of Belongings, SODA, February 6, 2011 - Shortly after 1 pm on February 6, 2011, Wayne Woods, 71, of Soda, was eating at a restaurant in Livingston when he received a cell phone call from his son in Lufkin. His son informed him that his barn was on fire. Woods dropped what he was doing and headed home to find his barn (located behind his house on Soda Loop West) engulfed in flames. 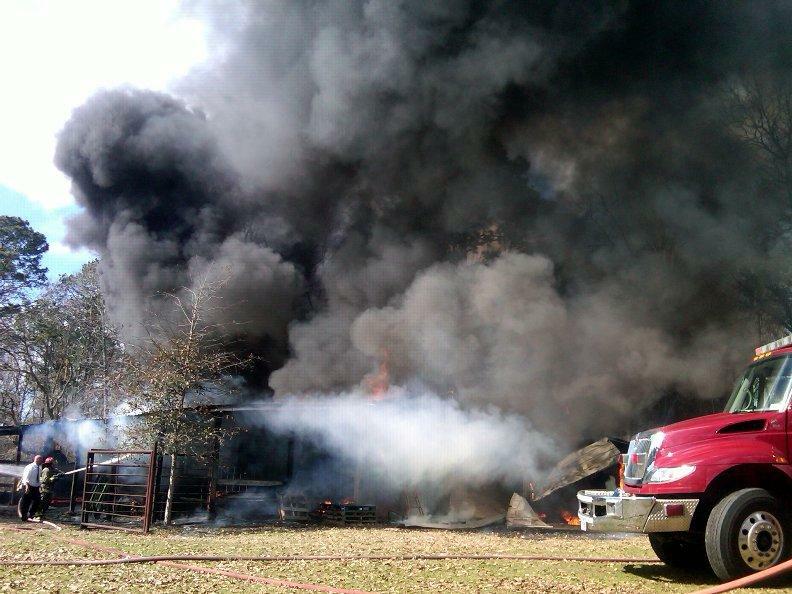 Volunteer fire departments from Livingston, Indian Springs, and Alabama Coushatta were dispatched to battle the blaze. According to Woods, the barn had a lot of stuff inside including 1 Kubota tractor, two John Deere Tractors, 2 Harley Davidson Motorcycles, a 1955 Chevy 2 door hardtop, two 4 wheelers, a Polaris Ranger and lots of other things. Woods kept everything in perspective. "I'm so glad nobody was hurt and I still have my house" he said to PolkCountyToday.com. The fire collapsed the roof on the main part of the barn. Woods did have his barn insured. The fire was extinguished by 2:30 pm. Wayne Woods (right) and his insurance agent watch as firemen work to get the fire put out. Deputy David Ramsey with the Polk County Sheriff's Office conducted a preliminary investigation.